Here’s another brilliant collection of 2xHD favorites. 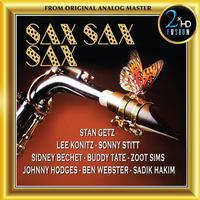 Great saxophone players including Ben Webster, Zoot Sims, Johnny Hodges, Sydney Bechet, Lee Konitz and Buddy Tate. A true saxophone extravaganza. The 2xHD logo on an album cover indicates that the recording was carefully selected and that the high resolution mastering was done using the 2xHD process. Created by producer/studio owner André Perry and prize-winning audiophile sound engineer René Laflamme in collaboration with several high-end audio equipment manufacturers, the 2xHD music mastering system combines the best of vintage analog with state-of-the-art DSD and DXD digital technology – a ‘Back to the Future’ approach. Each musical project is treated with individual attention to the selection of equipment. In the constant evolution of its proprietary mastering process, 2xHD has progressed to a new phase called 2xHD FUSION integrating a selection of high-end vacuum tube equipment in the mastering chain. For this album, the original ¼” 15 ips NAB or CCIR master tapes were played using a Nagra-T tape recorder which was modified with such tube playback electronics and connected from the playback head directly to a Nick Doshi tube head preamplifier using OCC silver cables. The Nagra-T, with its four direct drive motors, two pinch rollers and a tape tension head, has one of the best transports ever made. A custom-built carbon fiber head block and a head damping electronic system permit 2xHD FUSION to obtain a better resolution and 3D imaging. The resulting signal is then transferred into high resolution formats by recording it in DSD 11.2 MHz using a Merging Technologies’ Horus A to D converter. All analog and digital cables that are used are state of the art. The 2xHD FUSION mastering system is powered by a super capacitor power supply, using a new technology that lowers the digital noise found in the lowest level of the spectrum. A vacuum tube NAGRA HDdac (DSD) is used as a reference digital playback converter in order to A and B with the original analog master tape, permitting the fusion of the warmth of analog with the refinement of digital. 2xHD was created by producer/studio owner André Perry and prize-winning audiophile sound engineer René Laflamme.